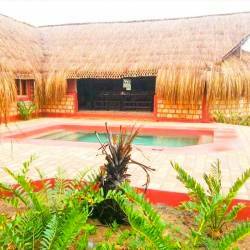 Self-Catering and Camping in Jangamo, Inhambane at Island Rock Resort from ZAR90.00 per adult camping. Sea Views and Restaurant on site. 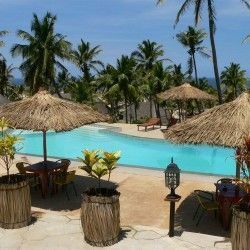 Situated in the town of Jangamo, just south of Inhambane in Mozambique, Island Rock Resort is aptly named after the huge rock at the end of a massive reef system which extends from the shore for approximately 3 km. Island Rock Resort offers various types of accommodation – camping, grass and reed casitas and lapas – as well as a restaurant. All the casitas have their own kitchen with 2 plate gas stove, pots, pans and cutlery and all of them (with the exception of the casita for disabled guests and the 8 sleeper casita) make use of communal ablutions. Guests are required to bring own gas bottles, fridge, linen, mosquito nets and towels. There are 22 casitas which sleep 4 people, 3 casitas which sleep 2 people, a casita which sleeps 8 people and the casita for disabled guests. 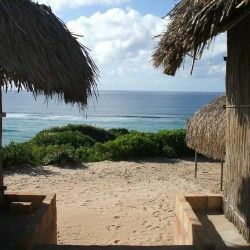 The two Lapas at Island Rock are brick and mortar buildings nested between the dunes in the indigenous bush. The lapas have been built with large groups of family and friends in mind. Lapa Orca has 5 units with 4 single beds, communal kitchen with fridge and gas plates, crockery, cutlery, pots, pans and an ablution block with hot water showers. Lapa Lagosta has 5 units which each contain 1 x double bed and 3 x singe beds. Each unit has own shower and toilet. A communal kitchen is equipped with fridge, gas plats, and kitchen utensils. The campsites at Island Rock Resort nestle among the dunes with private, semi-private and communal sites available. Each site has a power point. Nestled in a coastal forest, high up in the dunes, Island Rock Resort offers views of endless sun drenched beaches and the warm, blue waters of the Indian Ocean. A fee of ZAR150.00 per quad bike will be charged for the duration of you stay. Payable on arrival at Island Rock Resort.